Recycled Minds has reached out to activists taking part in the Occupy movement, and the initial response has been great! In the coming weeks we will be sharing a variety of experiences, perspectives, and ruminations from people who are on the ground at Occupy sites around the country. Our first Occupied guest blogger is a friend from Occupy LA who has worked diligently over the past few weeks to organize and manage a food tent and otherwise distribute sustenance and support to other occupiers. We would love to hear from more occupiers, so if you have your own Occupy experience that you would like to share, send us an email. ending the influence money has over our representatives in Washington." 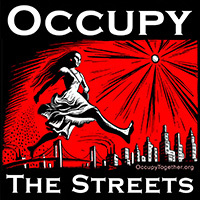 "Occupy movement activists ...have been criticized by some for having so many different gripes. But one of them said: it's important that protesters have many grievances. If they just focus on one thing, then there is less of a chance that a sea-change will occur in the culture. 'It can't just be about tuition or jobs or the economy or the wars. It's got to be about many things, because right now, many things aren't working,' said Joseph DeBartolo, a political science major at East Stroudsburg University." If nothing else, if there is a beginning, or even an attempt to separate money from politics, things will be better for everyone. If taxes are increased upon the wealthy 1%, it will make an improvement for everyone. Yes, EVERYONE. As former World Bank leader and Nobel prize winner Joseph Steiglitz said in Of the 1%, by the 1%,, for the 1%, "looking out for the other guy isn’t just good for the soul—it’s good for business." Inarguably, the current financial system is predatory, economic inequality in this country too extreme. In most first world countries a company CEO makes between 11 and 30 times the salary of an average worker – in this country it's over 450 times that – that is not just, and it’s certainly not “productive.” That must be changed, and everyone, from the Tea Party through the middle class, agrees the corporate influence over our government must be removed. How? Well, it's the job of legislators to listen to voters and implement changes. It's high time they do exactly that. And if those who like to negate rather than act are correct? If nothing changes in the government? Well, then, STILL SOMETHING GOOD HAS COME OUT OF IT--this dialogue. When the 'negative nancy's' chime in with: It's never going to go anywhere, do anything, be anyone, all I can think is: sheesh! Are you kidding me?! You are TALKING about it! You are talking about power distribution and food manipulation and taxes. You are talking about big vs small corporations. You are talking about lobbies and voting. Middle America has huddled down, pretending they're OK for so long that we've not looked around realizing EVERYONE has it hard right now...excepting the very few. Previously with a protest of any sort, people would go around with signs, shout, march, feel good and go home. And yes, small changes tend to happen in small ways with organized protests with a focus. This is more than that--this is a large scale long term protest with many demands, hoping for a LARGE CHANGE to our society, and the way society, the way WE THE 100% deal with distribution of money and politics and (im)balance of power. What's different about this movement is that people are sticking around, speaking with one another, figuring out what we want collectively and how to get it. SOMETHING GOOD HAS ALREADY COME OF IT--you, and others thinking and talking about it. Yes, laws from NY, to LA, and all across the USA have already changed, been implemented, regarding banks, foreclosures, and local taxation. Yet, as far as I'm concerned it is not the specific goals that matter. The seeds of change have been planted. Look around, and listen too: the dialogue IS the powerful wonderful good thing that has come out of the Occupy Together movement. So I leave you. It's Day 18 from the OccupyLA site at City Hall with NO ARRESTS, a kitchen tent and festival food permit coming in 2 days, and a grass donation to reseed the lawn when we're gone. We've changed a law regarding the way our city deals with bank foreclosures, we're feisty and thirsty (it's been 85-90 degrees), and we're marching, and talking, and voting and creating. How 'bout you? Labels: activism, corporate issues, guest contributor, Occupy, politics, U.S. Your message of collectivity is refreshing and good to hear. Hopefully people can stay positive through the process and move toward change together. Something good has already come - we now know that people will get out and do something about injustice! Hopefully there is plenty more good to come!